^ 中國古代水利. 燦爛的中國文明. 中國文化研究院. [2017-11-04]. 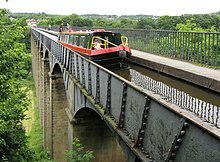 ^ Aqueduct crowned 'world wonder'. BBC News Online. 2009-06-27.